2015 is coming to an end & I’m here to tell you about my favorite product in the hair industry this year! I can hands down say Olaplex is my favorite product to work with as a hairstylist. Olaplex allows me to do more to my clients’ hair without compromising the integrity of their locks. Olaplex Bond Multiplier is added into the lightener/ color formula & at this time it’s literally multiplying & linking the bonds of your hair, preventing damage/ split ends & shockingly making hair stronger! 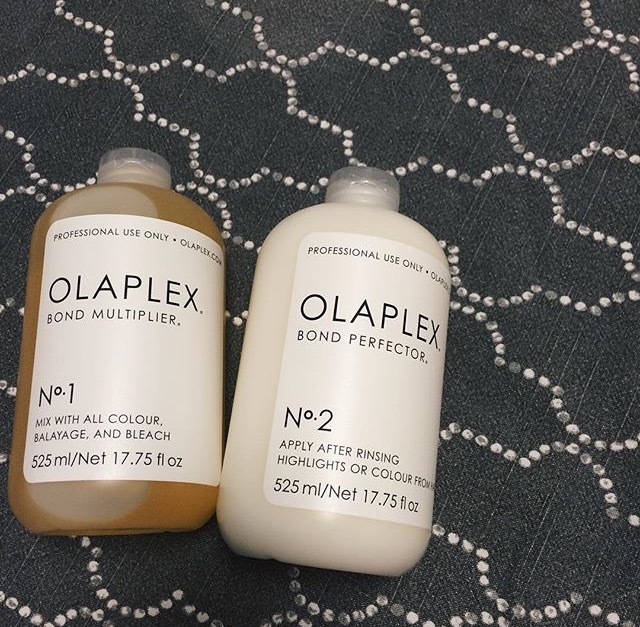 Next, once the color is rinsed the Olaplex Bond Perfector is applied, this is essentially the same product as the Bond Multiplier, except in a cream form. Although the same formula as the Bond Multipler both steps are necessary to achieve the healthiest hair possible! Olaplex can be used as a strengthening service alone or as a color service add-on, it’s for anyone looking to make their hair look & feel it’s best! Last, for those with hair that’s been through a little more stress I recommend getting the Hair Perfector which is Olaplex’s take home product so that you can continually work towards having stronger hair even when you’re at home! Olaplex gives me the confidence to perform color services on clients with damaged, fragile hair without the fear of breakage. This product isn’t only for blondes, but keeping in mind that it takes many sessions to achieve the perfect blonde, it’s almost necessary for all the Barbies out there. I always, always tell my clients, ” There’s no point in being a blonde, if it doesn’t look healthy! ” No one wants to see dry hair that resembles a broom stick! So if you’re considering changing up your hair or even just getting on the road to healthy hair I’d without a doubt recommend Olaplex! There have been multiple times while using Olaplex that I’m completely shocked at how amazing the hair feels at the end of the service, the results are truly mind blowing! Next Reality of Fantasy Colored Hair.